NOTE: This content is old - Published: Sunday, Jun 10th, 2018. Flintshire County Council has so far identified 1200 households in the county which leave extra bin bags out for collection alongside their black wheelie bin. Letters have been sent out warning them they face a fine if they continue to put out ‘side waste’ for collection. The council began to get tough on residents who put out extra bin bags in March by introducing side waste enforcement. Council staff starting visiting offending households to encourage more recycling and “advise on what can and cannot be recycled. If our help and advice is ignored and people continue to leave side waste, a £75 fine could be issued.” A council spokesperson said. Enforcement officers initially travelled with refuse crews to identify side waste ‘hot-spots’ within the county, this resulted in a sticker being attached on bins and a letter being posted to notify offenders they face a fine of £75 if they carried on. Of the 1200 households issued with letters just 22 ‘section 46’ notices have been served, these are a formal notice issued under the Environmental Protection Act which requires the occupier to place waste for collection in the bins provided. A report to be studied by councillors this week reveals no further action has been needed for those served with a section 46 notice and no fines have been issued to date. A North Wales Assembly Member raised concerns about Flintshire County Council’s crackdown on side watse after a number of his constituents said they were concerned it would lead to an increase in fly-tipping. One constituent wrote to the AM saying she’d rung County Hall about her extra bin bags and was told they weren’t being picked up in a bid to force people to recycle more. She said: ‘I and many others still have non-recyclable refuse to dispose of from time to time, and this is when the Council’s policy falls down and creates fly-tipping. The council is using its own enforcement officers to pinpoint side waste offenders, just a handful were retained by the authority after it outsourced litter and dog fouling patrols to controversial firm Kingdom Ltd who are dishing out around £22,000 a month in fines to people in Flintshire mainly for dropping cigarette ends. Assurances were given by the Cabinet member for Streetscene & Countryside, Cllr Carolyn Thomas that Kingdom would not be used for side waste enforcement. But, with just handful of council employed enforcement officers to cover the whole of the county – could the local authority turn to more innovative ways of monitoring and enforcing its rules around side waste? The householder wanted to know if bins and the outside of houses were being filmed by the trucks, and who, exactly will be prosecuted as per sign? 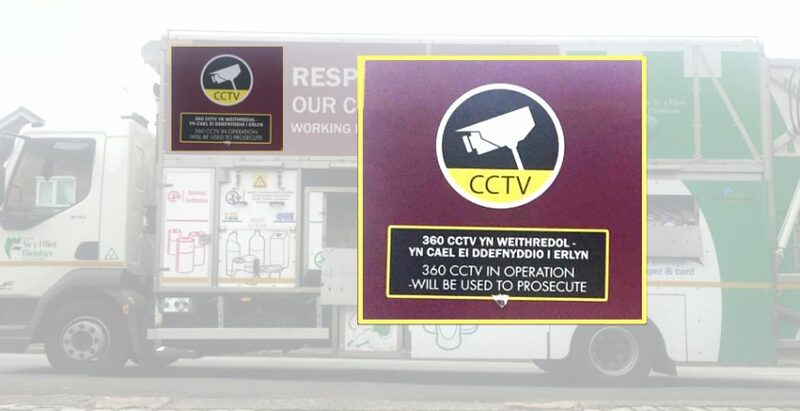 Flintshire Council refuse trucks boast ‘360 CCTV’ according to the signs – in fact each lorry has four CCTV camera’s – one on each side, one at the front and one at rear. “The main purpose [of the cameras] is to support the health and safety of both the collection crews and the public. The camera’s record activity around the vehicle and can be used to assist the Council in investigating vehicle accidents. In addition, other vehicles on the road that drive dangerously around our collection crews will be reported to the Police and if necessary the CCTV footage will then be offered as evidence. It will be up to the police to make any decision on whether to prosecute.